The scrap plastic to oil pyrolysis plant from Henan Doing Mechanical Equipment Co., Ltd is a green technology for waste plastic recycling. The scrap plastic to oil pyrolysis plant is well received by our customers home and abroad. Till now, our plastic to oil pyrolysis plant has been exported to more than 30 countries, such as Italy, Macedonia, Egypt, Jordan, Nigeria, Malaysia, Thailand, Mexico, Haiti, etc. Scrap plastic to oil pyrolysis plant can change scrap plastics into fuel oil environmentally friendly. Thus greatly help to solve the scrap plastic disposal problem. 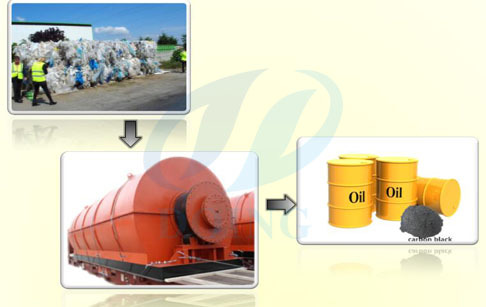 Our scrap plastic to oil pyrolysis plant has the following features. New technology scrap plastic pyrolysis plant has perfect cooling system which is improved based on the old technology. It can ensure all the oil gas get cooled and converted into fuel oil. Professional dedusting system will effectively process possible pollution in the smoke thus avoid zero pollution to the air. Exhaust gas recycling system can recycle waste gas for heating machine directly, which can save energy and environmental friendly during the process of scrap plastic pyrolysis to oil plant. We have strict quality control system on each step production of our scrap plastic to oil pyrolysis plant which will guarantee machine life and safety. Если вы хотите знать больше деталей о Scrap plastic to oil pyrolysis plantили о другом устройстве , вы можете отправить по электронной почте market@doinggroup.com. . Если у вас есть какие-либо вопросы, Вы можете обратиться к нашей профессиональной команде продаж и профессиональным инженерам . Вы можете посетить наш завод.